Quimby’s Bookstore NYC ALMOST OPEN! It’s true! It’s true! 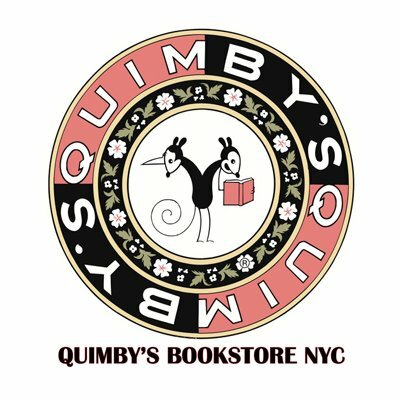 Quimby’s Bookstore in New York is almost open!!!!! And your zines are wanted there!!! Here are words from Steven Svymbersky, who wants them from you to sell there!! Words form him below, as well as the consignment form. Yeah!!! 1. The trademark “Quimby’s” and the trademarked logo are used with the permission of the mark’s owner, Chicago Comics Inc., which owns and operates Quimby’s. Neither the Chicago-based Quimby’s Bookstore or Chicago Comics are in any way responsible for transactions made with Quimby’s Bookstore NYC, a wholly independent company and sole proprietorship of Steven Svymbersky. 2. 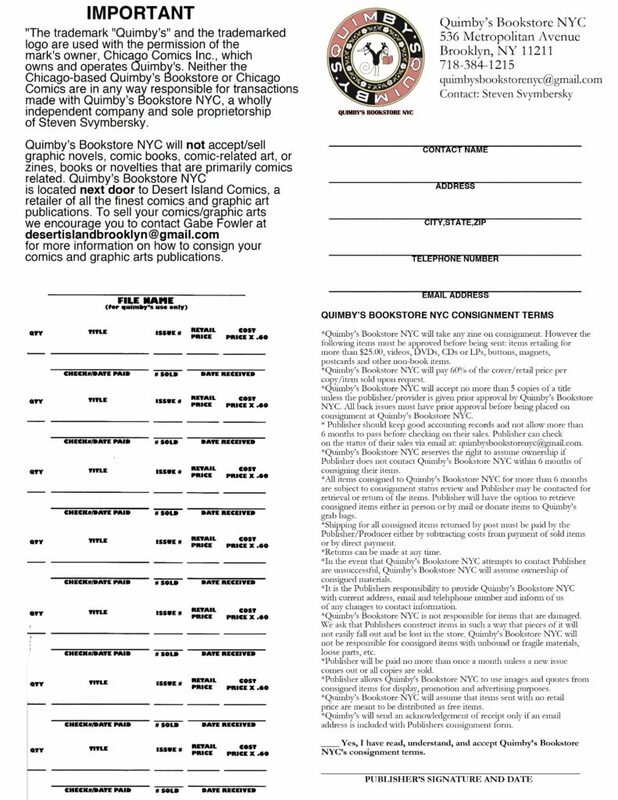 Quimby’s Bookstore NYC will not accept/sell graphic novels, comic books, comic-related art, zines,books or novelties. Quimby’s Bookstore NYC is located next door to Desert Island Comics, a retailer of all the finest comics and graphic art publications. To sell your comics/graphic arts we encourage you to contact Gabe Fowler at desertislandbrooklyn@gmail.com for more information on how to consign your comics and graphic arts publications. For any comics publishers that may be disappointed that there is not a new store to sell their wares, you need to know that there was no way I was going to be able to afford enough space in New York to carry all the publications that the much larger store in Chicago can handle. Had I moved somewhere farther from Desert Island and carried comics I would have had to make very hard decisions about what publications I could take and I would have had to turn a lot of publishers away. Finding this space next door to the best comic book store in New York is a huge blessing. Now fans can find all the great alternative publications they want in one easy to reach location. And between the two stores we can be all-inclusive. Gabe Fowler has been completely supportive and encouraging to my opening next door and in the spirit of true collaboration I do not want to compete with Desert Island in any way. If you want to sell your graphic novels, comics and graphic arts publications and novelties you can write to Gabe Fowler at desertislandbrooklyn@gmail.com. If you have non-comics or graphic arts zines, books or novelties, you can write to me, Steven Svymbersky at quimbysbookstorenyc@gmail.com. Tags: Desert Island, Quimby's Bookstore NYC.